Fear is a powerful motivator. These days it seems like a lot of institutions rely on fear to motivate others to act. Sometimes even people use fear for the same reasons. Fear of failure, fear of not being liked, fear of being ostracized by your peers. If you look around, you will recognize it in messaging everywhere. Fear follows business leaders too. None of us are immune to it. Some of our fears are more overt, while others are subtle. If we care about what we do, most of us fear the consequences of a bad decision, market pressure, technology changes, and what our competitors may do to impact our ability to do business. But what if you had no fear? What if there was a technology that insulated you from what keeps you up worrying at night? I have worked with thousands of businesses over the years, and the one trend I have seen that never goes away is how so many decisions are based on avoiding risk. Sometimes risk aversion becomes an uncanny, powerful, irrational fear. If you let your irrational fear dictate your decisions, you are lost. This is why we have CRM, and most importantly, Complete CRM, like what GreenRope provides and what I talk about in my book CRM For Dummies. With the right data, organized correctly, we replace irrational fear with calculated risks. We have all heard the expression "information is power" and all us know it to be true. The more we know, the more powerful we become, and the better we are at handling this fear. GreenRope's mission is to arm you with the information you need to make the best decisions you can. It isn't about giving you information overload. Rather, it's about helping you organize a lot of disparate data into a single system. GreenRope users know this already. Having your CRM connected to marketing, customer service, operations, as well as sales, means your information is already organized for you, neatly in one single system. On the flip side of a lot of information can be coined by the term "information overload". We have all felt this at some point in our lives, which is why CRM can be such a challenge if you're using a system that isn't designed from the ground up to be integrated and organized. Consider the traditional CRM model, where you can buy a CRM, and then buy all the different software components to link to that CRM. And then the software architects and engineers that manage all the interfaces and tie them together. This approach costs businesses on average over 20x the cost of an already-integrated system like GreenRope. Traditional CRM is expensive, but the real cost isn't about the money. The information never flows automatically to provide the entire organization with the information they need. Lack of information means people are forced to make guesses with their decisions. And this, of course, leads to fear of making the wrong decision, and sometimes actually making that wrong decision. Structure is what gives you the power to use your information to overcome fear. When you can see how your entire business is working, you know what works because you have numbers to show it. 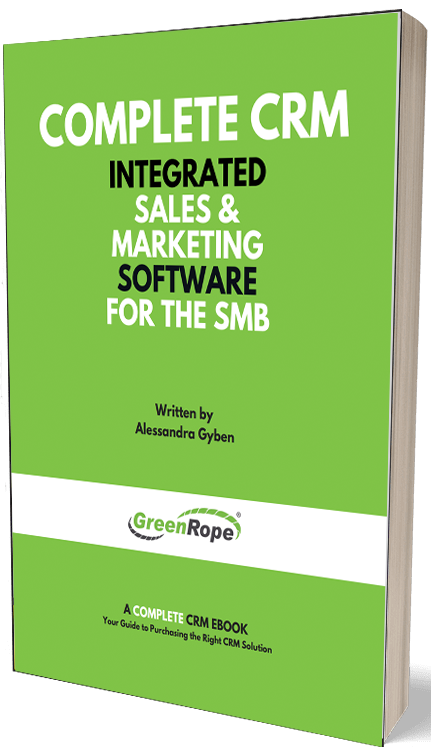 GreenRope provides you with both the information AND the structure your business needs. Because it's all integrated, you can pull up the relevant information when you need it, not when an engineer gets around to putting together that special report you need. The concept of our company name, GreenRope, comes from the two parts of "Green" representing sustainable revenue, and "Rope" because many strands make a rope strong. But if we look at it in the sense of GreenRope being a safety net for your business, the analogy of using information to protect you also works. If you haven't already, migrate your different business units into GreenRope. Help sales, marketing, customer service, and operations work together so you have the information you need to make smart decisions with calculated risks. Defeat the irrational fear with knowledge and grow your business with confidence and clarity.